Accused government whistleblower Edward Snowden speaks via video conference with members of the Committee on Legal Affairs and Human Rights in Strasbourg. 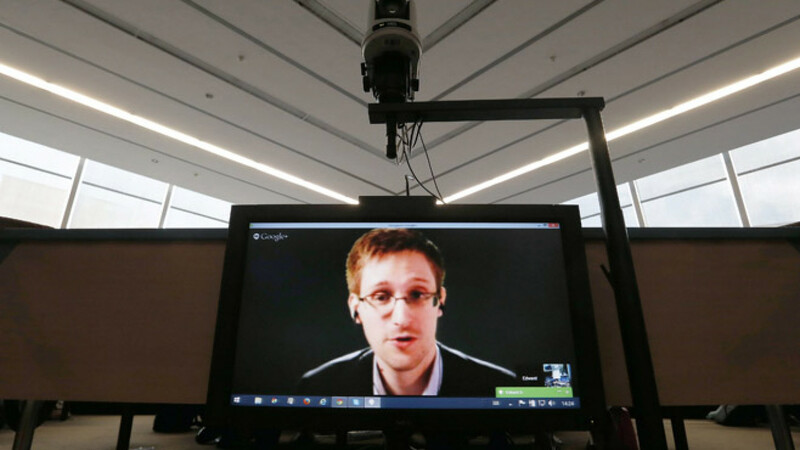 A year ago, an airplane carrying U.S. intelligence leaker Edward Snowden landed in Russia. It has been a wild ride for him since: nonstop prize nominations, chats with presidents and marriage proposals from female spies, among other adventures. The Moscow Times takes a look at some of the highlights of Snowden's first year in the land of vodka, oil and — apparently — freedom of information. All Snowden wanted to do was change planes in Moscow en route from Hong Kong to Ecuador, but then he disappeared. Journalists played the "where's Snowden?" game in the transit zone of Sheremetyevo Airport for days on end with the enthusiasm of 5-year-olds, and a few even accompanied the empty seat supposed to hold Snowden all the way to his next transit stop, Havana. He eventually emerged to admit that the enraged White House had canceled his passport and applied for asylum in Russia. The saga of Snowden's sojourn in the transit zone lasted for a biblical 40 days until the Kremlin granted his request. Lesson 1 for Snowden: Mother Russia does not let you go easily. First on the to-do list of any immigrant — even an intelligence fugitive — is getting a job. Capitalizing on Russia's extreme shortage of IT experts, Snowden scored a job as a developer at an unspecified "major Russian website," according to his lawyer, but no one came out and admitted to having hired the U.S. government's pale, bespectacled public enemy No. 1. The only website to admit interest in Snowden was Russian social network Vkontakte. The deal was never confirmed, and it looks like it was a close shave for the ex-NSA employee, given that the network's flamboyant founder Pavel Durov — "Russia's Zuckerberg" and outspoken advocate of Internet privacy — has since been fired in what he claimed was a government ploy to take over the unruly website and milk it for information on its 60 million users. So much for upholding privacy. Over the past year, Snowden has been deluged with awards, right up to a nomination for the Nobel Peace Prize — which his adversary, U.S. President Barack Obama, scooped up in 2009. It is not often you see two Nobel Peace Prize laureates at each others' throats, which perhaps explains why the award was instead given to the organization tasked with destroying Syria's chemical weapon stockpiles. Anna Chapman, the Russian sleeper agent expelled from the U.S. In 2010 , now a celebrity darling of men's magazines, tweeted in July that she wanted to marry Snowden. No forthcoming nuptials were subsequently announced, and the indignant 32-year-old redhead walked out on NBC's Richard Engel when he asked her about the story later. But the mental image of a happy union between an intelligence leaker and a spy is too good to give up — and besides, Snowden has kept a very tight lid on his personal life in Russia. The only time, to public knowledge, that Snowden spoke to his benefactor — President Vladimir Putin — was in April, when the he joined dozens of Russians on Putin's live call-in show. He asked Putin whether Russia had or planned any mass surveillance programs on par with what Snowden exposed in the U.S. Putin told him that Russia did not have the money for it, and that in any case, all national surveillance programs are closely overseen by governmental and public bodies. MT note: Russia's state surveillance program SORM allows extrajudicial monitoring of telephone conversations and Internet traffic. The latest version, SORM-3, in the works since 2009, monitors and analyses a wide range of personal data, including cellphone users' movements and contacts, bank transactions and even household water consumption. The program is not subject to any public oversight. The film rights to a book on Snowden by his Russian lawyer Anatoly Kucherena are in U.S. director Oliver Stone's hands, The Guardian said earlier this month. Sony Pictures Entertainment bought the rights to another book on the subject and is putting the producers behind the James Bond franchise on it. Admittedly, no Russian filmmakers have expressed an interest in Snowden, but that may be for the best, given the grisly and depressing arthouse that is Russia's cinematic forte. It is hard to see Snowden quietly dashing from Moscow to Hollywood to star as himself in a holiday blockbuster. But with luck — especially if Stone recalls his work on "Scarface" and "Conan the Barbarian" — Snowden could join Bond and Jason Bourne right there in the spy pantheon. The Moscow Times would cast Jesse Eisenberg, after a month in Hugh Jackman's gym.